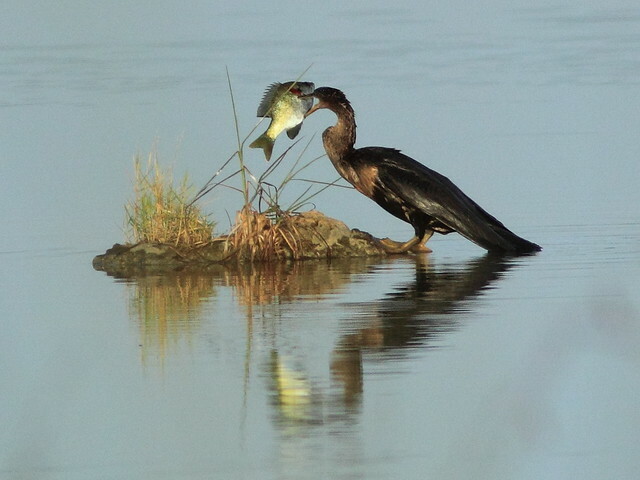 Anhingas are spear fishers. This calls for skilled swordsmanship because both mandibles are usually driven clear through the prey. The fish must first be weakened or killed, then flipped into the air and caught in its jaws so that it can be be swallowed head first. 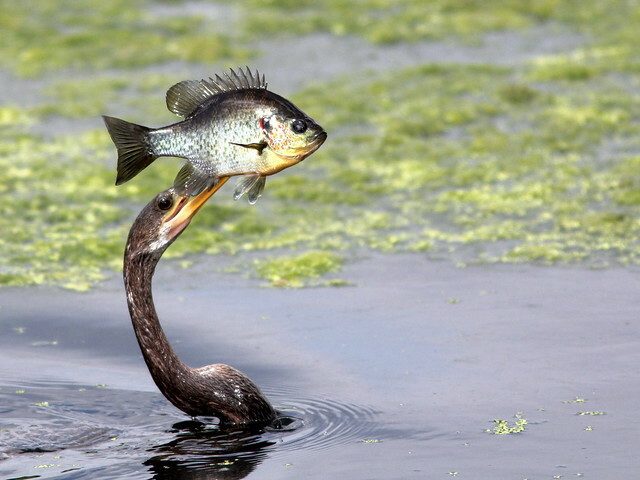 Photographed from a distance in the wetlands adjacent to our south Florida home, this Anhinga has captured a good-sized Red-eared Sunfish. Can she swallow it? anything bigger than your head from Ken Schneider on Vimeo. away but was quickly recaptured. If video does not display, see it here at Anhinga at Green Cay from Ken Schneider on Vimeo. This is my photo submission to the weekly Bird D’pot (Bird Digital Photography) meme at I’D-Rather-B-Birdin’. August 12th, 2012 at 12:22 pm Great shots!! Boom & Gary of the Vermilon River, Canada. August 12th, 2012 at 1:41 pm Your photos are great. I can’t wait to show my dh. Great quality and superb content! August 12th, 2012 at 1:55 pm What wonderful sequences! August 12th, 2012 at 3:13 pm Oh my gosh golly gee!!! Stupendous captures Ken. I have yet to find one in ‘the wild’ of this species since my birding obsession is kind of new. But, I’m hoping to see one in all its glory. I learned a great deal from your narrative…about what and how they deal with the meal after it’s been caught. Thanks for sharing, and thanks for the positive feedback you left for me in your comment…also, thanks for linking up with the Bird D’Pot. Have a great week ahead. August 29th, 2012 at 3:55 pm Thanks all, for your kind comments!